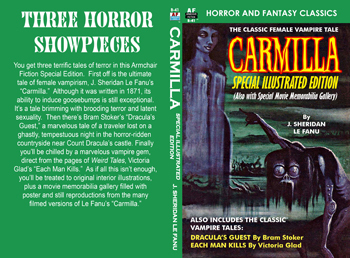 Armchair Fiction presents extra large paperback editions of the best in classic horror novels. Watch out…there are VAMPIRES within these pages! J. Sheridan Le Fanu’s “Carmilla” is a classic horror tale and one of the earliest examples of vampire fiction. It was written in 1871 and predates Bram Stoker’s “Dracula” by the better part of three decades. It is also a female vampire story, dealing with lesbianism during an era when such subjects were usually taboo—especially in fiction. “Carmilla” first saw print as a four-part serial in The Dark Blue magazine in 1871. It has been reprinted countless times over the past century-and-a-half. Critics have generally hailed it as an immensely entertaining short novel filled with gothic thrills and moments of latent terror. This Armchair Fiction Edition comes complete with original interior illustrations, as well as a movie memorabilia gallery featuring posters from the numerous filmed versions of Le Fanu’s classic story. Also included are two other vampire gems, Bram Stoker’s very underrated “Dracula’s Guest,” and Victoria Glad’s “Each Man Kills.” So pull up the bed covers and read on…if you have the nerve!